Last week, I had the chance to preview the new FlyOver Canada ride at Canada Place thanks to Virgin Radio and all I can say is WOW. It was AMAZING. The show lasts about 30 minutes, which includes the Uplift! By Moment Factory pre-show (where some Canucks make an appearance i.e. Burrows!) and the FlyOver Canada ride. The ride is where the real magic happens. You sit safely buckled in with your feet dangling in front of a huge 20m spherical screen. When it starts, the seats will move outward so that it's like you are suspended in air. Starting from Eastern Canada, you make your way across country, flying through gorgeous vistas and breathtaking scenery, finally ending up in the beautiful Vancouver! It was like I was really there! The film lets you get so close it sometimes it feels like you could just reach out and touch the water or horses you fly past. It was truly breathtaking. There were a few time that I could see the edge of the screen near the ceiling which kind of ruins the effect but those moments were few and far in between. Adding to the experience, subtle shifts in temperature, wind, mists and smells make the ride more real. Ah! I can't sing enough praises about this experience! This ride has renewed my interest in traveling in this beautiful country! FlyOver Canada was created by Andrew Strang and Stephen Geddes with the help of the Aquilini Investment Group. After over two and a half years in development, FlyOver Canada is finally ready to open its doors! 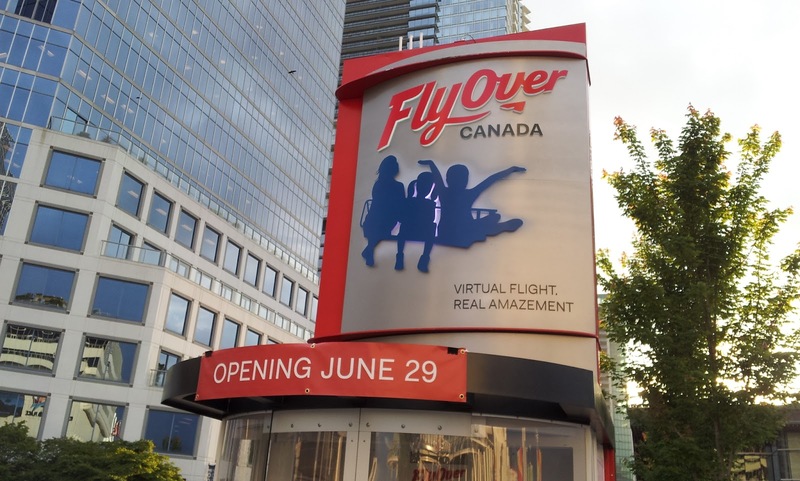 It will be open to the public on June 29th and tickets can be purchased online ($18.95 Adult) or at FlyOver Canada ticket booths located at Canada Place ($19.95 Adult).